Why should I give you my hard-earned money? Effective fundraisers answer this essential question every time they ask for a gift. What’s their secret to success? They have a winning case for support. As Tom Ahern, America’s premier fundraising writer, makes clear, a case isn’t some fancy argument you only develop for capital campaigns, when you’re chasing millions. Successful donor newsletters, websites, annual reports, donor acquisition programs, email, direct mail, advertising, planned giving programs, and, yes, capital campaigns, too all have one thing in common: behind each stands a well-reasoned, emotionally satisfying case for support. Donors are sure to have questions. Your case gives you great answers. 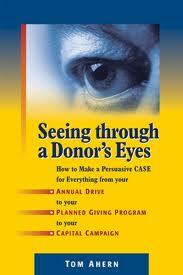 Complements Ahern’s acclaimed book, How to Write Fundraising Materials that Raise More Money.